There's a new designer drug that's raising alarm with authorities around the country. It's referred to as "bath salts," but it's really a dangerous stimulant with effects akin to cocaine or meth. While relatively unheard of just a couple of years ago, its use is on the rise and it's believed to have caused at least four deaths around the country. So what exactly are these new drugs -- and just how dangerous are they? CBS News Medical Correspondent Dr. Jennifer Ashton explained these substances are not about spas or baths. She explained, "The name sounds harmless. In reality, they are anything but harmless. These contain a designer or synthetic drug, mephedrone or MDPV. It's an amphetamine. 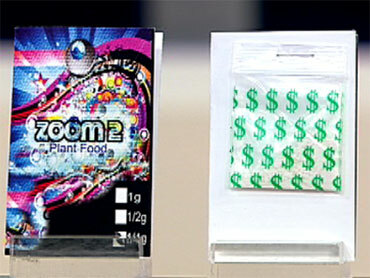 They're marketed as bath salts and you can find them online or in stores under names like Zoom 2 or Aura. Our producer found them very easily in New York City. When she asked for them, she was told, 'Wow, they're flying off the shelves. It's a good thing you're getting these.'" Hill added, "One of our researchers was told these will get you really high." But what exactly do they do? Ashton said, "It's a central nervous system stimulant, so it will increase your blood pressure, increase your heart rate, can cause anything from chest pain, heart attack, stroke. Those are just the physical symptoms. Some psychological (symptoms include) delusions, paranoia, psychosis. They're highly addictive, very dangerous." Ashton noted these substances have been reported to the Poison Control Centers by 33 states. "Part of the reason why this has gone undetected and under the radar up until now is because they're relatively new. And if you look it at the numbers in 2009, there were no reported cases to Poison Control Centers in this country. (In 2010,) that number jumped to 236. This year alone, we've ready surpassed that with 248 cases. And remember, that's just what's reported." Hill asked why there isn't more control on these substances. Ashton replied, "I guarantee you there will be. In fact the (Drug Enforcement Agency) DEA has already labeled these drugs a drug of concern. And there is legislation occurring right now to make them controlled substances. Again, these things take time. You just see those that time period, two years is 24 months, and for the DEA to start investigate a drug, they first need to hear reported cases, then they need to get their scientific medical communities, as well as legal ducks in a row, if you will, and that takes time. But this is by no mistake a dangerous substance and we probably will be hearing a lot more about it." But this isn't the only substance that is of concern, according to Ashton. "This is just one in a growing list of substances readily available online or in stores," she said. "Just because they may come there synthetic substances or natural substances does not mean they are safe. They are potentially life-threatening."